So many of you were eager to hear my crow story I could not make you wait. Since I do not have any good crow photos, I decided to create a montage to go along with my story. Ever since this experience I have loved crows and feel that the crow is one of my animal totems. 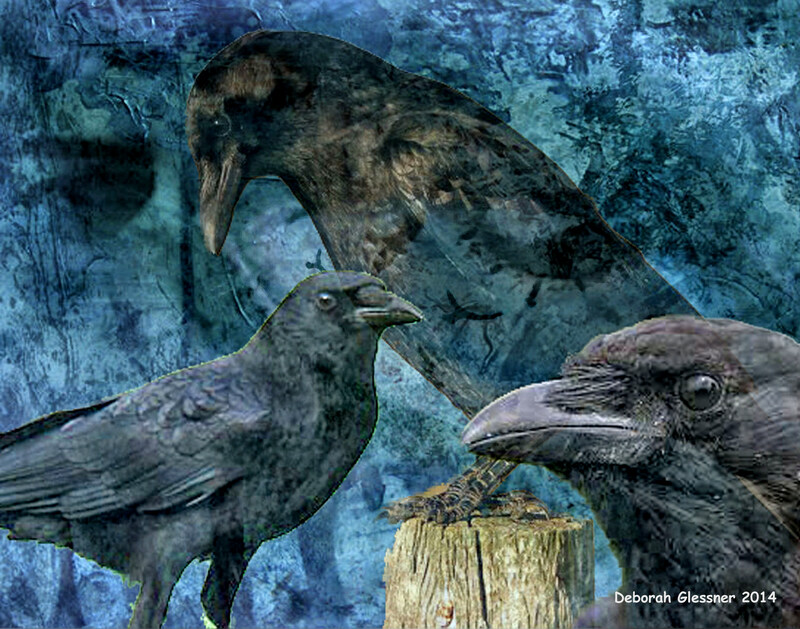 In fact, during shamanic journeying sessions, the crow would often appear to me and accompany me on my journeys. One day the crow identified himself as Abbo. I had never heard of such a name, so …out of curiosity I googled it and discovered that Abbo was a Neustrian Benedictine monk and poet of the Abbey of Saint-Germain-des-Prés in Paris. He was born about the middle of the ninth century. Fascinating! But, I digress from my story . . . I lived on a beautiful 90 acre horse farm in Churchville, Pennsylvania for 19 years. My apartment overlooked the horse pastures, and it was a wonderful view to observe all types of nature –deer, foxes, skunks, farm cats, and, of course, the horses. There were many sparrow hawks that would alight on the fence posts and hunt for mice. The pasture sloped down to a turn-out shed and then made a sharp right hand turn to run back towards the Churchville reservoir which bordered the farm and is where I now walk my dogs. One winter day after we’d had snow, I was standing at my kitchen window looking out over the pastures and distant woods. I noticed two crows on the ground in the pasture and started to watch them. They have such an amusing, cocky strut-walk. They were going down on their bellies and sliding and fluffing in the snow. Suddenly I became aware that there was something very ritualistic about what the crows were doing. One crow would flop down on its belly, push off with its feet, and slide down the slope. When it lost momentum and stopped, he would stand up and walk back up the slope to the starting point and repeat the ritual. The second crow joined in and started to do the same thing. And so I stood there at my kitchen window, just mesmerized by these two crows having a blast in the snow playing their “slide down the slope” game — flop down on belly, push off with feet, wheeeeeee sliiiiiiide, and then walking back up the slope (mind you, walking, not flying) to repeat the game. It just changed my whole perspective of crows, their intelligence, sense of fun, and yes, sense of humor. As an observer, I could only begin to imagine the communication occuring between the two crows as they enjoyed the snow. A magical experience and totally endeared the crow to me. I feel such an affinity with and for this brash and very smart corvid. It has been quite awhile since I last posted a blog entry, so I imagine many of you who signed up as followers will be surprised to receive a notification in your email. In the meantime, I have become active in an online Facebook community for people who wish to nurture and share their creative work or ventures. The Open Group For Bedlam Farm (OGBF) is the brainchild of author Jon Katz who felt it was important to have a safe place for creative people to gather, learn, support, and share. We have quickly become a wonderful community, and many of us are looking forward to meeting each other in person at one of the Bedlam Farm Open House events in 2014. Because of my participation in this community I have considered reigniting the blog, even though I am no longer really on the breast cancer journey except for regular follow-up visits to see Dr. DuPree and my medical and radiation oncologists. In September of 2012 I was diagnosed with breast cancer. I went through all the preliminary testing, including a biopsy, to confirm that the suspected tumor on the mammogram was cancerous. A lumpectomy followed, and I was very fortunate to learn that my margins were excellent and lymph nodes were clear. The tumor was small, and I was told I was an excellent candidate for the balloon catheter method of radiation. While the catheter itself is invasive, the radiation is less invasive because it is delivered right to the area needing to be addressed. An added bonus was two treatments a day for one week as opposed to a longer time span. My emotions were on a roller coaster, and, as my wonderful surgeon told me, “Breast cancer is an emotional emergency, not a medical emergency.” I remember the first time I walked into Bott Cancer Center at Holy Redeemer Hospital. ME? No, not ME! But, yes, I was now one of those cancer patients. With the support of wonderful friends, I got through the breast cancer journey, blogging along the way. Again, I was fortunate that I only needed radiation and no chemotherapy. When it was all over, I thought I would be able to put it all behind me. However, that was not to be. I now visit my three oncology doctors on a regular basis. I see my surgeon every 6 months, and my medical and radiation oncologists less frequently (8-10 months). The doctors are trying to work out a schedule of equally staggered visits, so that I am seeing one of them at least every 4 months. BUT, as the header to this proclaims, “I DO NOT HAVE CANCER.” I was a breast cancer victim, yes. But I do not have cancer. I had a cancerous tumor removed successfully, but I do not have cancer. Yes, the cancer could reappear, but I do not have cancer. The mind and body connection is powerful, so I chose to accept and believe that I DO NOT HAVE CANCER. Bill Moyers wrote a wonderful book called Healing And The Mind, which was also produced as a 5 part PBS television series. I was amazed at the power of the mind, and this is why I choose to affirm to myself that I DO NOT HAVE CANCER.